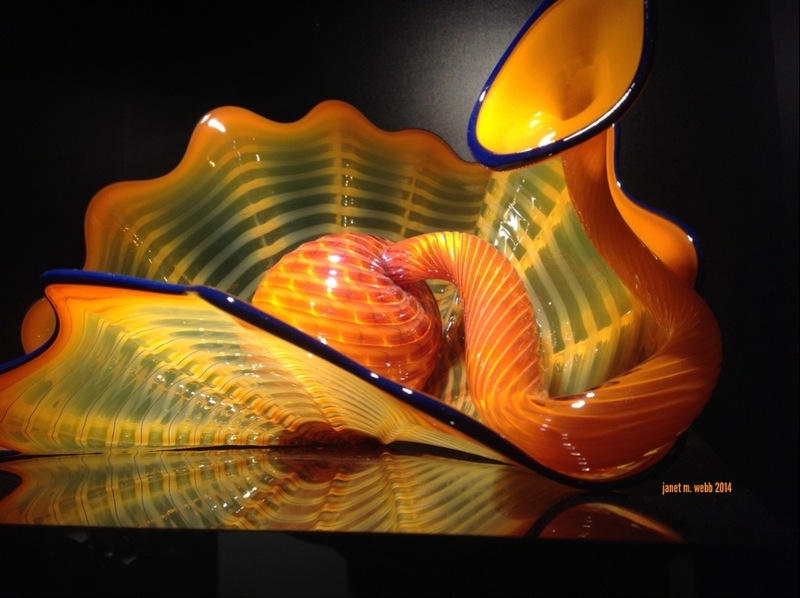 My object for this week’s challenge is a Chihuly bowl. Fabulous! Love those mysterious shapes and contrasting colours. I wish I could afford one of his pieces, but in the meantime, I’ll just enjoy looking at them whenever possible. Is Dale a bloke or a sheila (as we’re supposed to say down here)? Whichever, the talent is kind of breath-taking, Janet. I hope you have lots more pic.s!! Goodonyer! I remember well your posting about going there, with photos of other amazing things. Wonder if I can take photos from the zipline? Don’t worry, my phone and iPad (and perhaps a camera) will be with me. Ho yairs … I forgot you’re a phone person, Janet. It’s because I’m not that I don’t keep that option in my mind. I am now that I have an iPhone with the fab camera. Ooooo, don’t I wish!!! This beauty is probably around $5,000 or more, a bit out of my price range. His things are just wonderful, Raewyn. They bring joy to me to see them. I love glass and he does some of the most beautiful glass I’ve ever seen. Thanks, Magdelena. It’s easier to get a good shot when you’re working with something this beautiful. Great choice! This object is incredibly beautiful! Thanks, Amy, There were more bowls (or whatever this is) and all of them were stupendous. Looking forward to seeing more… Beautiful image! It is, isn’t it? If I owned it, I think I’d be running my hands over it all the time. Beautiful photo. He does incredible work! Beautiful! I was introduced to Chihuly by the law firm I used to work for. They had purchased a huge piece of his and donated it to the Orlando Museum of Art. Once you see his work, you’re hooked. Good thing it’s beyond my price range. 🙂 But I’m always ready to see any that happens to be around. It is that! He has more that are just as beautiful, although most don’t have the twisty part. To have both the imagination and talent to do these is quite a blessing and gift. Good luck with that ticket. I’m sure Easy would love drinking from that bowl!! Great lighting and highlights on this, Janet! I can’t really take credit for those, Cathy, as the bowl was on display. 🙂 Nice of them to make it so easy for me. First time I hear about them, and first time I see one! I get they are expensive, but beautiful! Hi, Chris. Chihuly’s work is beautiful and found all over the world, so some day you might be able to see some. It looks as thought there’s a piece near you in the World Trade Center, Schiphol Airport, Amsterdam, 1996. Here’s a list of public installations throughout the world: http://www.chihuly.com/places-public-installations.aspx. Thank you Janet! Have not looked in the list yet, but is there one in the Victoria and Albert Museum in London? Yep, it is in the list. I think it is a big lamp hanging in the entrance, and I have a picture of it somewhere. Nice to have a name to go with it. Chris, once you’re introduced to his work, you’ll know it if you see it. You’ve really captured the magnificence of this piece. It isn’t easy to photograph fine sculptural color work like this. I can really appreciate the work through your photograph. Nice picture, and a beautiful piece, makes me think of a dragon. Thanks, Daniel, it does have the feel, doesn’t it? A very lovely unique object! Thanks. It’s a stunning piece of glass work. I hope my photo did it some justice. I can only hope my photo did some justice to the beauty of the piece. Great minds indeed Janet !